Our water heaters are a bigger part of our lives than we realize. We wake up in the morning and jump in a hot shower to get us moving for the day. All is well and good until you get in and realize the water is freezing. If your water heater isn’t working as it should, it’s time to hire a licensed, qualified professional to fix your water heater. Water heaters are complex pieces of equipment that should only be operated on by a qualified plumbing expert that know the ins and outs of how water heaters are built and operate. Electric water heaters are common, especially in older homes. Unlike like gas-powered water heaters, these use good old-fashioned electricity to heat and cool your water. These are beneficial for several reasons including smaller size, safer in general, and they are quite a bit cheaper. While they certainly have their benefits, they still need attention from time to time. The most common issue is the lack of hot water. That is why we have one, right? If you find yourself stuck with freezing water, there could be a few things causing the problem. Lack of power to the unit itself is a typical offender. Checking the fuse box is often the first step that a professional would check after they’ve inspected the unit itself. You might also find yourself stuck with limited hot water. It’s not a pleasant feeling when your hot shower suddenly turns into an ice bath. The thermostat on the water heater is usually the culprit. Checking the thermostat to make sure the water is at an acceptable temperature can often resolve the issue. Occasionally you might find the thermostat doesn’t work at all. Give us a call and we can replace the thermostat right away. Other common problems include the water not heating quick enough or the water is consistently too hot. For timing problems, it could be an issue with power. A low supply voltage takes longer to heat the same amount of water. Getting it replaced is essential to get it back up to speed. If you are experiencing consistently hot showers, it might be time to revisit the thermostat. If an adjustment doesn’t fix the problem, give us a call. Electric water heaters can have other issues than just the temperature of the water. The water pressure can skyrocket that makes for an uncomfortable shower. Using the pressure reducing valve and changing the PSI to 50-60 PSI can help alleviate some of the discomfort. You might occasionally come across some water with a bad odor. Odors are usually caused by bacteria in the water that makes its way through your pipes. Different heaters have different recommendations for this, so checking your installation manual will be your best option. When in doubt, call in a plumbing tech to inspect your water heater and fix any outstanding problems as well. Gas Heater? We Fix Those Too! Gas heaters are more common in newer homes. Most homeowners have had to deal with the dreaded pilot light from time to time in an attempt to figure out what’s causing their problem. No fear because Plumbers 911 is here to help. Out of hot water? Check the pilot light. The thermocouple has a built-in safety measure that prevents the flow of gas if the pilot light isn’t on. No light means no heated gas to heat the water. Not having enough hot water is a common problem for most. Just like electric heaters, gas water heaters have a thermostat that controls the temperature. Located on the gas valve, check the thermostat to ensure it is working properly and is set to a reasonable temperature. The pilot light is the one main difference between gas and electric. Keep this lit and most problems take care of themselves. What happens when you have trouble with the pilot light, though? If you have trouble lighting the pilot light, read the instructions first. Often it’s a simple step that’s overlooked that is causing the pilot light to remain unlit. If you’ve covered the basic steps and still have no luck, you may have a bad gas valve. If the gas valve doesn’t deliver the gas, the pilot light won’t be able to light. Another, and more common cause, is the thermocouple. Most instruction manuals will have you check this first before moving on. Keeping the pilot light lit can also cause a problem. A pilot light that continually goes out is usually for the same reason as one that doesn’t light at all. Check the instruction, inspect the thermocouple, and finally, the gas valve. One of those steps will get you back on track. 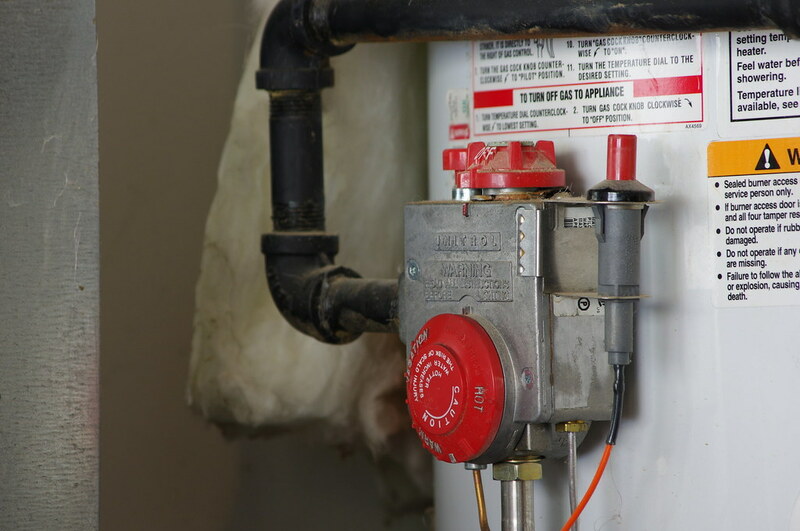 Your water heater may heat water just fine, but still run into other issues. Black or rust colored water can seemingly show up out of nowhere. This is caused by a dissolved anode. Anode rods are designed to oxidize instead of your tank. Over time, the anodes will dissolve and need to be replaced as soon as possible. If you neglect this step, you’ll likely end up with a leaking tank. Look at your instruction manual to identify the parts and determine the point of the leak. That will give us a clearer picture of what needs to be fixed. Give us a call anytime for any of your water heater repair or replacement issues. Sometimes it’ll be a quick fix, and others might need a complete replacement. We’ll inspect your unit and give you your best option. We will only recommend a new unit if that is the best option. Most fixes are quick and can be done in a manner of minutes. Let Plumbers 911 be your trusted source for water heater repair and installation.